Looking for a great group activity to do with your friends that's different from the usual Paint Night and "Escape the Room"? How about cooking a meal for the residents of your local Ronald McDonald House (RMH)? The “Meals from the Heart” program provides volunteers with an opportunity to prepare brunch, dinner, or desserts for families who are staying at the House. RMH welcomes students, families, corporate teams, and any group that would like to volunteer. It's an amazing way to spend a few hours with your favorite people doing something that gives back to the community. Volunteering helps strengthen the bonds between those in the group. Statistics show that when employees volunteer together they feel a sense of unity that is carried back with them to the workplace. For families, it’s a chance to spend quality time with each other while helping those in need. One of the best ways to get your employees engaged in a corporate giving and volunteer program is to include them in the actual development and implementation of your program. A way to do this is to create a volunteer team of ambassadors who will oversee and execute the planning and logistics of the various events and processes associated with your program. This team should be one that rotates members every 1-2 years to avoid stagnation and encourage new perspectives and ideas. There are many benefits to having groups like these in your company. First, it solves the resource issue. Having a team of volunteers ready and eager to assist you with these tasks is a godsend because resources are a precious commodity in any organization. Most of us are doing more with less as it is, so a team like this makes it possible for you to do a lot without adding to your operating expenses. Second, this is a great way to empower your employees. Being a part of a team that is tasked with developing programs and activities focused on making the world a better place speaks to a purpose-driven culture. Providing employees with opportunities that give them the sense that they are doing meaningful work is powerful. It is a key driver of engagement, as evidenced in research and studies conducted by organizations like Aon Hewitt, considered pioneers in the area of employee engagement. Choosing the right members for the team is critical. You’ll want to recruit people who are passionate about community service and are committed to helping you implement and grow your program. They should have a firm belief in your company’s purpose. These are people who demonstrate the company culture in their daily interactions with colleagues and customers. They will be representing your company in the community so great care should be taken in selecting the members for this team. Many business leaders and professionals have told me over the years that they want to be more involved in supporting their communities. They want to start a charitable giving or volunteer program at their company, but they feel intimidated and have no idea where to begin. I’ve been told that they are serious about embedding the values of service and community into their organizations but they fear being met with resistance, either by employees or leadership. Others feel that they are “just one voice” and don’t think they will be taken seriously. Does this sound like you? If so, “A Million Dollars In Change” is your guide to starting the conversation about social responsibility with your leaders. This book will provide you with a step by step plan to creating a program that engages employees, attracts talent to your company, and helps forge measurable, impactful partnerships with nonprofits that serve your broader community. Thank you to all our social media followers and everyone who has supported “A Million Dollars In Change”. We’re grateful for your help in sharing the message of the book with the world. 2018 has been an incredible year. 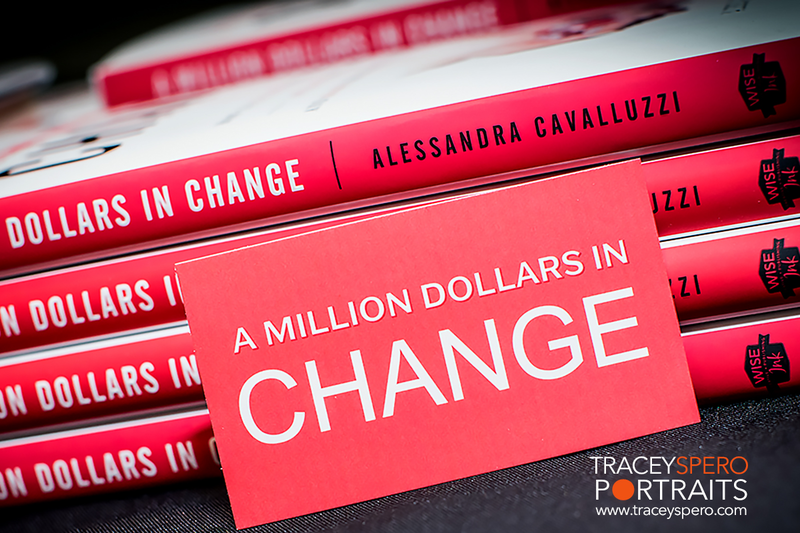 We’ve met people from all walks of life, diverse industries and backgrounds since “A Million Dollars In Change” was published in March. It’s been a pleasure getting to know you all and hearing your stories. We’re excited for 2019 and the opportunities that lie ahead for advancing social good and making the world a better place. Happy New Year! May it be a successful one filled with peace, happiness, and good health for all. In the USA, November is a month when we find ourselves contemplating gratitude more so than we do at other times of the year. The Thanksgiving holiday reunites us with family from near and far, and social media is filled with posts about the "30 days of thankfulness" or similar challenges aimed at making us focus more on our blessings than our problems. But what happens after November? If you're like most of us, you slip right back into old habits. The challenge ends and with it ends our practice of focusing on our blessings. Now, I'm not going to pretend that I have the gratitude thing nailed. I definitely don't. But I will say this, I am much happier when I make it a point to practice identifying something to be grateful for every day. They key, of course, is making a point to do it every day. Sure, it's easy peasy when things are humming along in our lives. It's when we hit roadblocks, unexpected illnesses happen, or we suffer losses that it becomes almost impossible to find something to be thankful for. But we have to try. You see, there is a lot of negativity in the world. People are at odds with each other. Many have forgotten the importance of connecting with another despite differences of opinions and thoughts. Social media has made more people feel isolated and alone than ever before. People compare themselves to others who appear to have the "perfect life"... or the illusion of a perfect life. Now more than ever, we must practice gratitude for the good things in our lives. It helps keep us grounded. It reminds us of what is really important. In practicing gratitude, we help others see the good things in their lives, too, and the good in people in general. Start right now. What are you most thankful for today? It doesn't have to be something poetic or deep. It could be something as simple as "I am thankful for this delicious cup of tea because it is helping me unwind after a very long day". Boom! Simple, relevant, easy. Start with the little things. Before you know it, you'll find you have more to be thankful for than to be upset about. Try it. Start with a week. Then extend it another week. Then another. Keep it going until it becomes a habit. You have nothing to lose and everything good to gain. Last weekend I worked at the Making Strides Against Breast Cancer Walk. As a corporate sponsor my company has a booth at the walk. The weather this time of year in New York is typically cold so we're used to it being chilly, especially at 6:30am when we arrive to begin setting up our booths. Over the years we've seen it all in terms of weather: rain, high winds, even sleet and hail one year! On the rare occasion we've had warm days in the upper 60F temperature range. Last Sunday, October 21, was not one of those days. While the thermometer read 40F it felt more like 20F with the blustery wind coming off of Zach's Bay at Jones Beach State Park. The whipping winds made it feel like January. In fact, a few times we thought our tent might go airborne, and by 10:00am we were pretty much numb. I suffer from Reynaud's so it was especially challenging and very painful for my hands (even with gloves to protect them from the cold). While the weather conditions were less than ideal, the smiling faces of survivors and the thousands of others who turned out for the walk kept us going. It was a great day supporting a very important cause. There are over 200 Making Strides Against Breast Cancer walks across the USA with many of opportunities to get involved. Whether you contribute via a corporate sponsorship, walk in support of someone battling the disease or in memory of those lost, or volunteer to help on-site, there are many ways to make a difference. It’s easy to make an impact and help raise awareness at the same time. Look for a walk near you and sign up today. Together, we can help make breast cancer a thing of the past. Empathetic leaders are in high demand and for a good reason. Studies show that employees who view their managers as compassionate tend to be more engaged. The reason is that employees want to feel that their needs are being met, they are being heard and they are valued. They want to know that their manager has a vested interest in helping them succeed that goes beyond the company’s bottom line. Recent research by Businessolver found a staggering difference between how CEOs viewed the level of empathy at their company and how their employees viewed it. Specifically, 60 percent of CEOs viewed their company as being empathetic, compared to only 24 percent of their employees. This huge difference points to a big disconnect between executives and their workforce. But how important is empathy to the overall success of a business? Is it really that big a deal? Welcome to my blog. You'll find tips and helpful information here on how to create and launch a corporate giving program that will go beyond charitable donations to engage your employees and create measurable and lasting change in the community. You don't need a million dollars to make an impact. A little goes a long way and small acts over time lead to big change. That's what we call "million dollar change". You'll also find my thoughts on leadership, and some of my favorite books, authors, and things. Views expressed here are all mine. You can view my older blog posts here: http://agivingculture.typepad.com/my-blog/.